My rating in words: New all-time favorite! I read this book in less than 12 hours. It would have been even less if this pesky little thing called ‘work’ did not have to happen in that time period, but oh well. So to say I loved it is an understatement. I FREAKING ADORED THIS BOOK! It was cute and fun and witty and absolutely adorable! Practically the whole time I was reading it I had a big goofy smile on my face. A few days later and that smile is still there. I don’t want to read anything else. 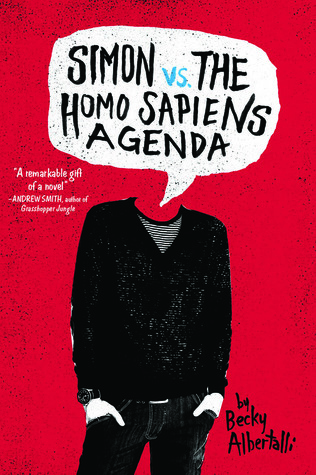 I just want to re-read this book over and over and then I want Becky Albertalli to write more about Simon because I could just read about him going on his day-to-day business forever! So let’s take a minute to recap exactly why I liked it so much. First of all, there’s Simon, who is just a great main character. He’s in the high school drama club, thinks iPods are the window to your soul, has perfect grammar and loves Oreos. He’s definitely flawed, but that just made him all the more real and likeable. His voice was so fun and recognizable. Plus he’s a Harry Potter nerd so let’s be honest – as soon as I knew that little fact I was already in love with him. The romance is just soo cute and adorable. I loved reading the e-mails between Simon and Blue and watching them get a little more flirty every time. Now, I was spoiled on the identity of Blue before even starting this book (my own fault, I should know by now not to browse Pinterest for book quotes and fan art before reading the book. I can’t help it, guys!). I thought this might lessen the reading experience for me, but it actually did not. I liked picking up on the little clues here and there and I loved watching everything unfold. Though I would not recommend spoiling this for yourself, as I do think it’s a fun reveal and guessing Blue’s identity together with Simon would be part of the fun. I also really liked the light-heartedness of the plot. Yes, it’s about a gay romance and it deals with the difficulties of coming out and bullies, but it’s not dark or heavy either. The issues are there and they are being handled in a well written and thought-provoking way, but it was not the only defining aspect of this book. There’s the friendships, family dynamics and just general coming-of-age aspects that are dealt with as well in this book and I personally liked how everything was handled. Another thing this book did great was the diversity! There’s the obvious diversity in sexuality, but it also has characters with different religions and from different races. I just loved the points it raised and the issues it adressed. Suffice it to say I LOVED this book. If you are in the mood for a LGBTQ YA book that is light and fluffy yet witty and thought-provoking, with an honest and relatable portrayal of high-school dynamics, friendship, family and an adorably cute romance, this is the book for you. Nick and I look at each other. “I’m not holding your hand,” I tell him, smiling a little. Thanks! I really, really loved this book so I definitely recommend it 🙂 Hope you’ll enjoy it!